Five men have been convicted of conspiring to cause explosions in Britain. One of the men was Anthony Garcia. Sentencing him to life in prison, the trial judge told him he had turned his "murderous ambition on the UK". Anthony Garcia was very different from his co-defendants. He was not of Pakistani origin and grew up with mainly white friends. He enjoyed basketball, the music of rapper Tupac Shakur and dreamt of becoming a male model. Asked why he had changed his name to Anthony Garcia, he said: "Modelling. If you have a name like Anthony Garcia it had a better ring to it in the modelling world." 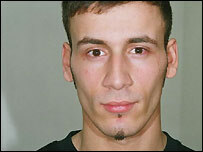 Born Rahman Benouis in Algeria, his family moved to east London when he was a child. He went to school in the Ilford area. He left school at 16 and at around the same time his father chose to change the family name to Adam, because "it sounded more English". As a teenager Islam played no part in his life. He drifted through a variety of jobs and spent his money on clothes, drink and cigarettes. His older brother, Lamine, was always his role model and when he became increasingly interested in Islam it was natural for Garcia to follow. Throughout 1998 and 1999 the brothers attended Islamist political meetings and began discussing issues such as the treatment of Muslims in Indian-administered Kashmir. Garcia vividly recalled being shown a video about "atrocities" allegedly perpetrated by Indian forces in Kashmir. "It was the worst thing anyone could have seen. Little children sexually abused and women... and I still remember it quite clearly," he said at his Old Bailey trial. Garcia said he remembered crying as he watched the video and he decided to do something to help his fellow Muslims in Kashmir. He began by fundraising for the Kashmiri cause. But by the beginning of 2002 he was determined to go to Pakistan and get military training, although he insisted he never planned to fight in Kashmir or Afghanistan. Initially the mujahideen rejected him as a security risk - he was "too white" and would stand out. But in November 2002 he met Omar Khyam, who said he would arrange a training camp if Garcia was able to raise enough money. Garcia also spent a great deal of time on the internet, e-mailing fellow sympathisers. By 2003, when the plot was under way, Garcia had a girlfriend who lived in Colindale, north London, and spent much of his time there. He worked nightshifts at Tesco but spent much of his time daydreaming about becoming either a model or a jihadi fighter. He travelled to Pakistan and attended the same paramilitary training camp as Omar Khyam. Keeping a spoof diary for friends, he described Khyam as a "72" - referring to the belief among jihadi fighters that martyrs receive 72 virgins on entering paradise. It was Garcia who made the initial visit to Access in Hanwell to ascertain whether he could hire a unit to store the ammonium nitrate. Later he returned, with Omar Khyam and Nabeel Hussain, and they paid a deposit to hire the unit. Mr Hussain always maintained he was duped by Khyam - the jury agreed and found him not guilty. Garcia later claimed Khyam told him to buy the fertiliser and said it was going to be shipped out to Pakistan, but it was clear he knew its real purpose all along.